Item number 1590/104 from the MOA: University of British Columbia. Triangular Masonic-style brooch with irregular edge. 18 cutouts, of which 10 semi-circular, 6 rectangular and 2 diamond-shaped. Base has two bell-shaped protrusions. Some engraving still visible. Cross-pin. Maker’s mark in a square cartouche. Silver ornaments represent an important part of early exchange between Europeans, including fur traders, and First Nations people, especially in eastern and central Canada and the USA. Initially, the main source of silver was British, French and Spanish coins. Most ornaments were produced by silversmiths of European origin in North America and Europe, and were actively traded only from 1760 to 1821. By the mid-18th century silver objects were produced in New England, Quebec and Montreal. Silver was used by First Nations people as a sign of rank. Silver ornaments in these styles continue to be produced by native silversmiths in central Canada and the USA. Brooches were the most popular and numerous silver ornaments. They were worn on the chest, but also in the hair. Frequently, many were worn at once in rows across the chest. Secret masonic emblem of compass and square adopted by Iroquois to represent the “Council Fire”, a meeting of chiefs. The Freemasons whose symbols are plumb, compass, square, level. 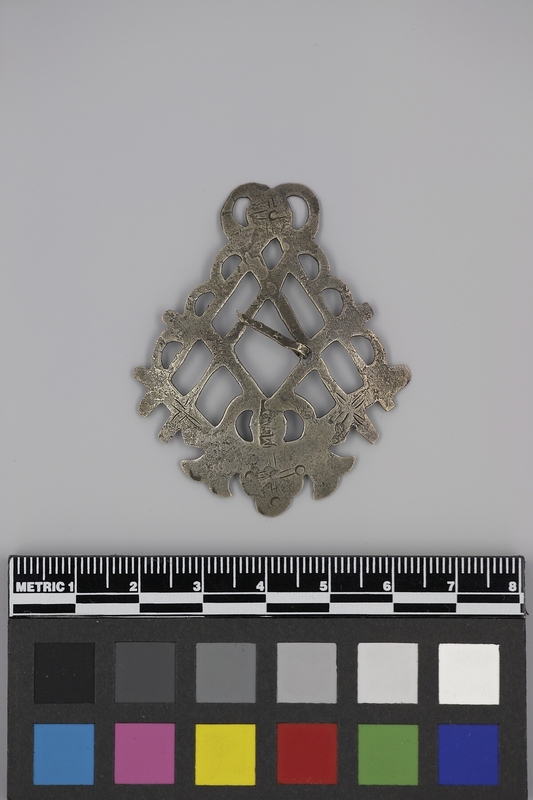 The Masonic-type brooch may have been introduced by Mohawk Iroquois Chief, Joseph Brant, who in 1775 became a member of the Masonic Order in London. Saint John, New Brunswick, Canada ? Canada: New Brunswick ?, Saint John ?